Customers who make purchases that are worth more than $3500 will get a surprise gift worth $300 in addition to the other two. This exclusive deal is only for Cyber Monday. And, customers will need to use the code “CYBER15” to take advantage of the offer. Customers can pick anything from the collection and there is no minimum order value to obtain the discount. Customers enjoy the benefits of free-shipping worldwide and 45-Day returns. The zero-percent interest financing is the best benefit the store is providing to customers who wish to make the payments in 2 or 3 installments. Being one of the best online stores for fine gemstone and diamond jewelry, Angara has a wide assortment of designer jewelry. The store offers a varied selection of gemstones at the most competitive prices. Be these sapphires, rubies and emeralds or tanzanite, moissanite and onyx; Angara has them all. The additional attractions here are the style choices – classic to modern, vintage to retro, and the customization of stone size and quality. Further, there are three choices of metal available – silver, gold or platinum. The Cyber Monday Exclusive offer on purchase above $3500 is the one that makes for a must buy from Angara this season. Angara.com is an online fine gemstone and diamond jewelry retailer. We are specialists in gemstone jewelry including sapphire, ruby, emerald, tanzanite and birthstone jewelry. We save our customers over 40 percent vs. other jewelry retailers by manufacturing our own jewelry and many of our gemstones. We have been covered extensively in the press including coverage in America’s Next Top Model, Forbes, Crains New York, and WWD. Address: Angara Inc., 550 South Hill St, Suite 1625, Los Angeles, CA 90013; customer.service@angara.com. 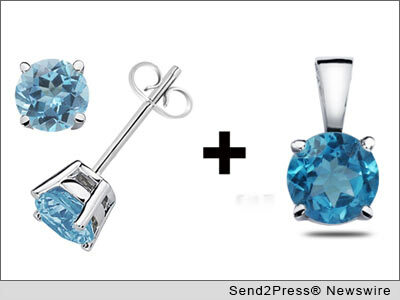 Original Keywords: Cyber Monday, bling, diamond, jewelry, Blue Topaz pendant, gemstones, gifts, cyber Monday, online jeweler, online fine gemstone and diamond jewelry retailer Angara Los Angeles California LOS ANGELES, Calif.
REFERENCES: Entertainment News, Cyber Monday, bling, diamond, jewelry, Blue Topaz pendant, gemstones, gifts, cyber Monday, online jeweler, online fine gemstone and diamond jewelry retailer Angara Los Angeles California LOS ANGELES, Calif.